Despite cutbacks and financial stress in the industry, the mainstream daily newspaper is still on the job, reporting corruption in public office. For example, here are a few boiled-down summaries of reports that I found over the past month in the local daily I subscribe to. Michigan Attorney General Bill Schuette announced the fourth round of criminal charges in the Flint water crisis. The state charged five persons with involuntary manslaughter in the death of Robert Skidmore by Legionnaire’s disease. An outbreak of the waterborne disease, which killed 12 and struck dozens more, followed the switch of the city’s water from the Detroit system to the Flint River. Among those charged are Health and Human Services Director Nick Lyon and former Flint emergency manager Darnell Early. Lyons is accused of failing to alert the public to the outbreak of the disease for a year after he became aware of it. He is also charged with misconduct in office for instructing an official to stop study that would help find the cause of the disease outbreak. The state also charged Michigan Chief Medical Executive Dr. Eden Wells with obstruction of justice and lying to a police officer. 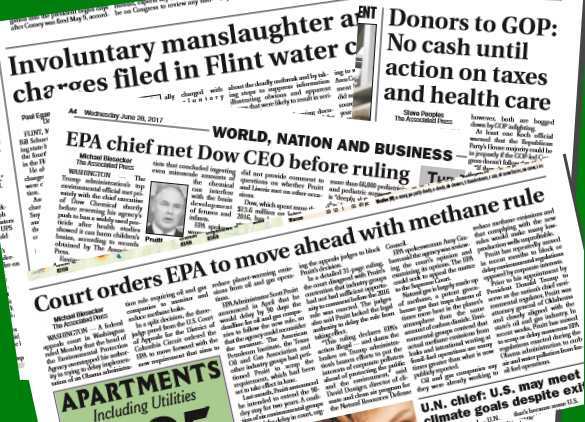 The obstruction of justice charge alleges that Wells threatened to withhold funding for the Flint Area Community Health and Environment Partnership if it did not stop its investigation into the source of the disease outbreak. The Koch brothers held a retreat in Colorado Springs for donors that pledge at least $100,000 this year to the Koch’s vast political action network. Also, 18 elected officials attended. Among them were five U.S. representatives, all of whom are members of the House “Freedom” Caucus. Among those were Mark Meadows (R-NC) and Jim Jordan (R-OH), the current and former heads of the caucus. One wealthy Texan donor, Doug Deason, said that Meadows and Jordan recently asked him about backing fund-raisers for them. Deason answered that the “Dallas piggy bank” is closed until he sees effective action on “repeal and replace” of the nation’s health care law, and sweeping “tax reform.” Both of those policy items would result in huge tax cuts for the wealthiest persons. EPA Administrator Scott Pruitt has denied a petition to ban the use of the pesticide chlorpyrifos on food. In doing so, Pruitt reversed the agency’s prior decision, which was based on a review by its scientists. The review found that even minuscule amounts of the chemical can interfere with brain development of fetuses and infants. The EPA is bound by law to ensure that pesticides used on food are safe for humans, especially children, to consume. At a Congressional hearing Pruitt said his reversal decision was based on “meaningful science.” But, queried by members of Congress, as well as the AP, Pruitt could not point to any scientific evidence that chlorpyrifos is safe. Since the 1960’s, Dow Chemical has sold so much chlorpyrifos that traces of it are commonly found in sources of drinking water. And one study found detectable amounts in 87% of umbilical cord blood samples. In a former job as Oklahoma attorney general, Pruitt described himself as a “leading advocate against the EPA’s activist agenda.” In March, Pruitt attended an energy trade show also attended by Dow CEO Andrew Liveris, and met with executives from Dow and other companies. Dow Chemical spent $13.6 million on lobbying in 2016. It also spent $1 million for President Donald Trump’s inaugaration festivities. In February, after Trump signed his executive order to create task forces to rollback regulations, he handed the pen to Liveris, who was standing at his side. Dow is also lobbying the Trump administration to “set aside” findings that chlopyrifos harms 1800 critically threatened or endangered species. The D.C. Court of Appeals quashed EPA Administrator Scott Pruitt’s decision to delay for 90 days the agency’s methane rule. The Obama administration had made the rule to monitor and reduce methane emissions from oil and gas drilling. The court said, contrary to Pruitt’s claim, that stakeholders did indeed have sufficient opportunity to comment on the rule. The court’s decision means that the EPA must immediately start enforcing the methane rule, which aims to tamp down global warming. Though not as long lasting in the atmosphere, methane traps about 80 times more heat than the same amount of CO2. As Oklahoma attorney general, Pruitt had sued the EPA to try to overturn the methane rule. Pruitt’s EPA has also proposed a two-year delay while it considers repeal of the rule. The court’s decision does not affect that proposal, because it has not yet been made final. The Trump administration is working to undo nearly all of the Obama administration’s environmental rules, and all regarding methane. But the D.C. Court, which is the main court for hearing regulatory challenges, warned that it would take a hard look, and only allow delays that are specifically required by law.